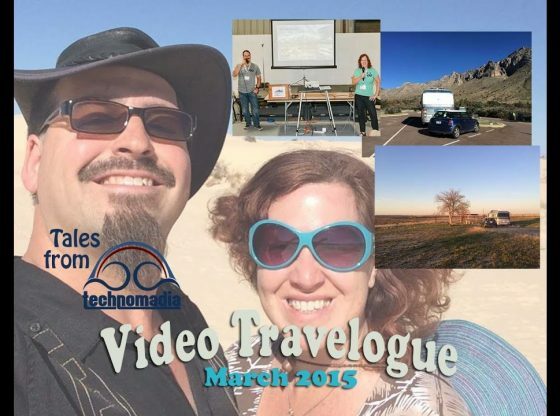 Chris & Cherie of Technomadia.com share about their March 2015 travel adventures repositioning from Arizona City, AZ to the outskirts of Austin, TX. Over the month we stayed at Picacho Peak State Park between Phoenix & Tucson, participated in the Escapee’s Escapade in Tucson helping launch Xscapers.com (a new support network for a new generation of RVers), Catalina State Park, a winery in Deming New Mexico, driveway surfing in Las Cruces.. and then heading north of I-10 exploring new to us territory of Guadalupe Mountains National Park, Monahan Sandhills State Park, San Angelo State Park and then ending the month at Pedernales State Park in Johnson City, TX. Whew.. over 1000 miles traveled in the month! It’s been a great month of new adventures and fabulous people we’ve spent time with. We’ve been on the road full time since 2006, working remotely the entire time – we love this lifestyle, and enjoy sharing about all aspects of it. We generally host and post a live video topic monthly (we pick a topic and host a Q&A session – www.technomadia.com/video for more info). We also post interviews with our nomadic friends every 4-6 weeks in our Ramblings series, and share a monthly travelogue from our own nomadic travels like this one. Thanks for joining us!